Office-Bag QL2.1 High Visibility–the briefcase with two faces. During the day a classic business bag in elegant black, in the dark a highly reflective safeguarding companion. The smart bike briefcase is manufactured out of a Cordura fabric interwoven with reflective yarn. Hit by a car‘s headlights it is not only the typical ORTLIEB reflector but the entire bag‘s body that reflects. The 21 litre volume briefcase easily takes large files and a laptop as well as all your daily needs from notebook, smartphone to thermos etc. Two divided inner pockets keep small things in place and organized. 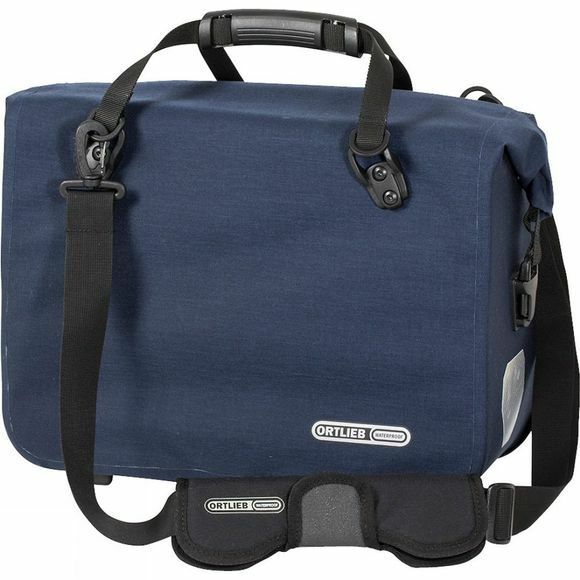 A waterproof and dustproof roll closure ensures safe transport in any weather. The ORTLIEB QL2.1 system allows fast and easy mounting and removal of the panniers with one hand. The QL2.1 hooks can be adapted to the rack without requiring any tools, and are suitable for tube diameters from 8 mm to 20 mm (hook inserts 8, 10 and 12 mm are included), a 20 mm hook is available as spare part e.g. for E-bike racks. Big enough for one or two (size L) DIN A4 folders, pens, cell phone, lunch, etc.